Buster Brown Always Best Buy Shoes Ad 1958 This is a August 25, 1958 advertisement It is a nice color ad from Buster Brown Division, Brown Shoe Company, St. Louis. Picture by Alex Ross. Pictures a young boy sitting at a school desk. He is painting. Little girl is standing by his side and holds a picture that maybe she painted. In mint condition. Photo is taken through plastic and may show wrinkles or crookedness that is not in the ad. This magazine tear sheet measures 9 1/2"" wide by 13 1/4"" tall. 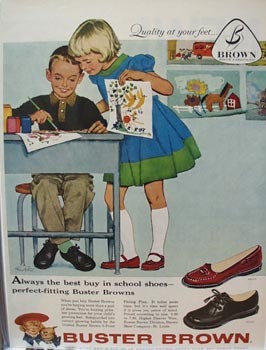 Items Similar To "Buster Brown Always Best Buy Shoes Ad 1958"